My life is one battle after another with headphones that can’t cope with my strenuous workouts. I’ve had them fit snugly for five minutes then fall at the first hint of sweat, and I’ve almost given up hope I’ll ever find a suitable pair. 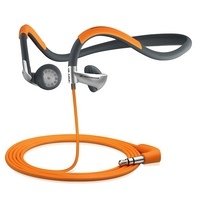 Sennheiser have just released news of FIVE new headphones that bring an orange beacon of hope to my exercise attainments. The new range includes five tough sporty models that are built for active use, and as well as being water resistant, they’re also washable! I like the look of the PMX 80, £35 (pictured above) as the rugged back band that fits around the head looks like it won’t be going anywhere and it also includes a vertical transducer system for crystal clear audio. If in ear is more your style you might like the CX 380 which comfortably slot into the ears, and use neodymium-iron drivers. The ‘phones range in price from £25-£50, so there will definitely be something in your price range, and the new orange shade adds some much needed brightness to your workout gear. Wow, according to the email they are also SWEAR resistant! Who knew! But that bonus feature seems not to appear in the full article.